If you want to rotisserie a roast, it needs to be secure on the rotisserie spit and trussed into a tight package - a spinning rotisserie turns an untrussed roast into a wobbly oval. To truss a roast, we need to tie it every inch and a half to two inches along its length. There are fancy ties that use one long piece of butcher’s twine; I take the simple approach and cut a length of twine for each tie I want to make. 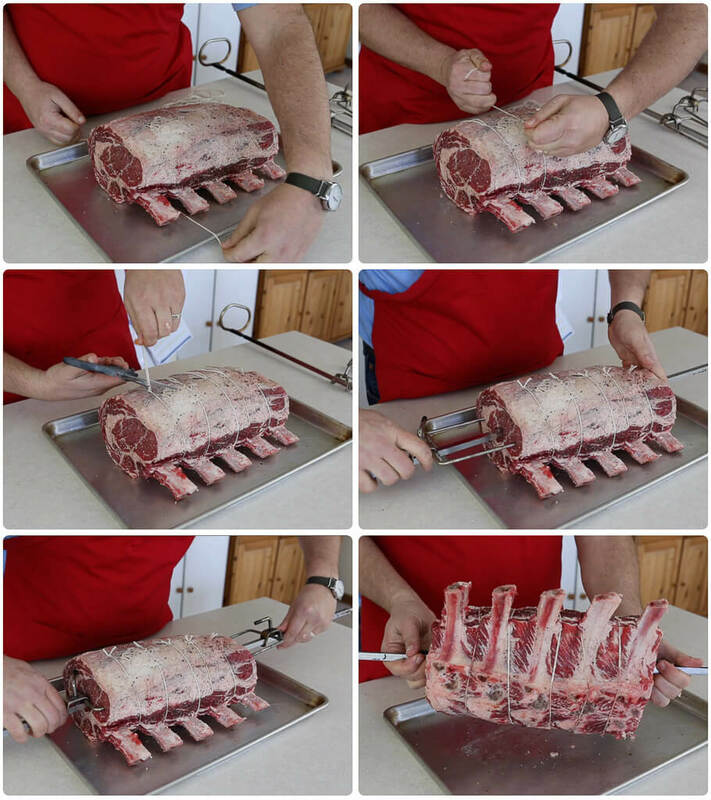 If the roast is boneless, but a single muscle of meat (like a loin), it needs a truss tied every two inches or so. Roasts with less structure need more trussing. Deboned leg roasts for example - with the central bone removed, they want to fall apart. Deboned roasts should be folded or rolled into their original shape, then trussed every inch and a half to hold them together in a tight package. As I mentioned in my poultry trussing post, use a double loop to start the knot. This adds tension when you pull tight, and holds the first tie in place while you complete the second tie to finish the knot. Run the spit through the center of the roast. If the roast is thick enough, push the tines of the fork into the roast to hold it steady; if the roast is narrower, use the fork as cage around the meat. Slide the second fork onto the spit and secure the other end of the roast. Make sure the roast is centered, moving it back and forth on the spit if necessary, then lock down the second fork. You’re done - the roast is ready for the rotisserie.